The Patio Andaluz Hotel is located in the heart of the historic center of Quito, surrounded by churches, museums and national monuments of the city, just steps from the Plaza de la Independencia, the Cathedral, El Sagrario, San Augustine, San Francisco and countless buildings that have become witnesses of the most important processes in the country. Inside the walls keeps centuries. It was part of the original solar that made the city of San Francisco de Quito, at the time of its founding. For patios and corridors have been great thinkers and people of Ecuador's history, where you can enjoy the elegance and comfort of a boutique hotel, with large arches, balconies, attics and an air of old Quito. 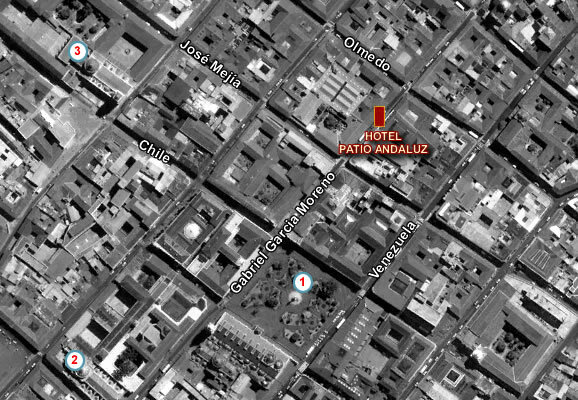 Patio Andaluz Hotel has 11 suites and 21 standard rooms with all modern amenities required hospitality. All rooms are decorated in colonial style meeting international quality standards and is able to receive tourists and business people are accustomed to five star hotels, providing a traditional feel special and historic.